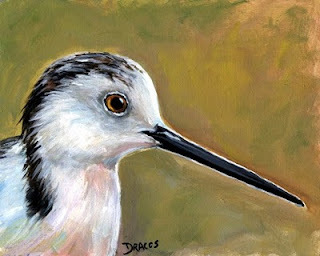 Black-winged Stilt, or Avocet - another non-dog painting! Yay!! I'm sorry; I know many of you follow my work because of my dog paintings, but I'm having a really, really good time taking a break from dogs for a while. I know it was prompted by my total overload at the recent Rose City Classic Dog Show I did here in Portland, but it was also just something I knew I needed to do for a long time and didn't really have the nerve to try. I know it's going to allow me to paint dogs with a fresh perspective - and I and my customers and followers will be happier for it. 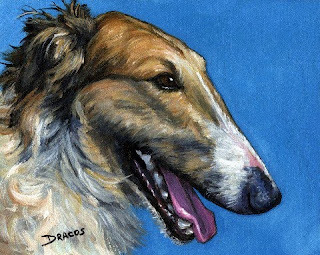 This is an 8x10 Borzoi painting I finished last week before I started my "other-animals-than-dogs" painting sidetrack. I love it, and it's more what I'm after than the too-tight work I had begun to do before I decided to take my break. 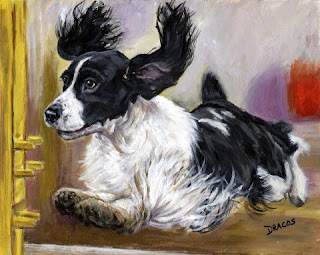 It's the last dog I painted before my self-imposed break from dog paintings. I hope to have more in a similar style when I return to dogs. The original is still for sale. Oops! 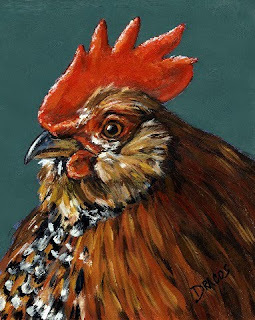 I forgot to list my rooster that I painted yesterday! I don't know what kind of rooster this is. I only know I found him to be very beautiful. We used to have chickens (for eggs only) and this one poor, lonely rooster, who had the most sickly-sounding crow that we felt sorry for him. Plus, we kept him locked out of the hens' house, so he was a pretty sad figure -- but so very beautiful! 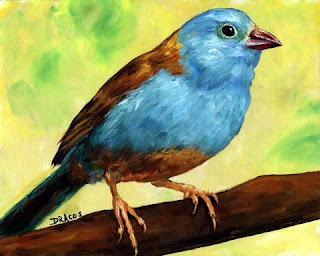 Anyway, this is another of my recent non-dog paintings that I wanted to share with you. Hope you're enjoying my "entr'acte." I'll be back to dogs before too long. Wow, I needed this!! 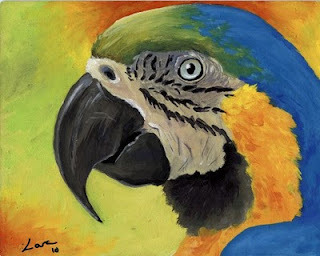 It is soooooo refreshing to be able to paint something besides my beloved dogs. 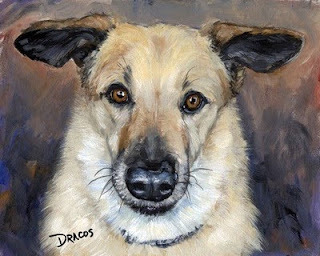 Please don't get me wrong: I still love painting dogs, and I love dogs. I just was in desperate need of a break! It also shows me how very hard dogs are to paint -- in my humble opinion, that is. They have awfully complicated faces, with very distinct bone structures, which in addition to hair color, length, degree of straightness, etc., vary from dog breed to dog breed. But, hey, they're beautiful beings, whom I love dearly. 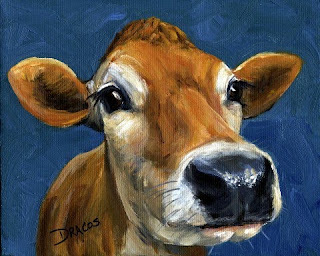 I don't know yet what I'll be painting tomorrow, whether it'll be a dog or yet another farm animal. But, again, I promise I'll be getting back to dogs soon. 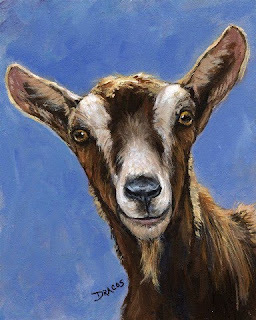 A Toggenburg Goat! I needed a break from dog paintings for a while! 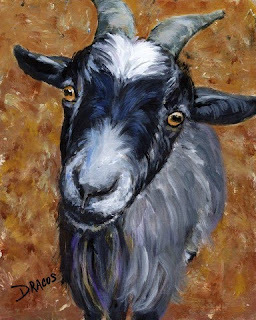 Okay, I know it's a goat, not a dog! It's different, but I really needed a break. It'll be good for me. With all the commissions I've been doing, I've been working tighter and tighter, and it's not a good direction for me. This being an artist is always supposed to be fun - because it's what I love doing more than any other "job" I've ever had in my whole life! I was reaching a point where I dreaded going to work each day. 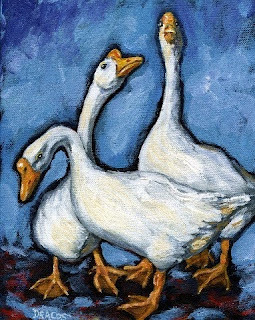 So it's time for just some fun, loose, no-stress (well, a little bit of stress still), non-threatening types of paintings. 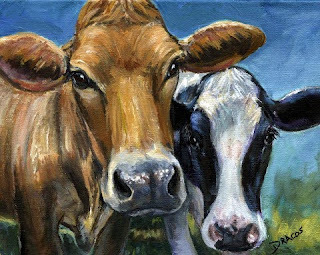 So look for more non-dog paintings for the next week or two. Then I'll get back with a fresh, clear, eager mind to painting dogs again. All you people, by the way, that I met at the Rose City Classic Dog show -- all those of you that either allowed me to photograph your dogs or that sent some of your own dog's photos to me ------ thank you, thank you, thank you! It was wonderful to meet and talk to you all, and I promise I'll do my very best to get every one of your beloved dogs' paintings done. So please bear with me while I clear my mind, loosen my brush strokes. We'll all be happier for the wait, I promise.